Sure, 2016 had its share of new TV shows that weren’t worthy of investing any time in checking out. Fortunately, among this year’s crop of new TV shows were more hits than misses. Overall, 2016 was a pretty great year for new scripted shows, making it difficult to whittle the list of the best new TV shows of 2016 down to just 10. Less difficult was deciding which new series earned the top spot as American Crime Story: The People v. O.J. Simpson was an easy choice. 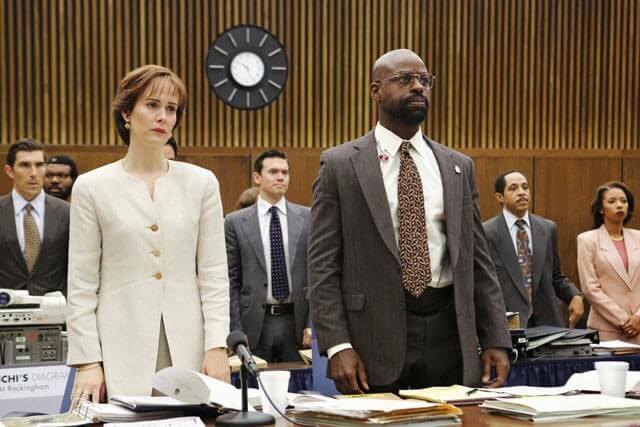 The series not only made viewers finally understand what lead prosecutor Marcia Clark was up against, but also kept the audience engaged in the murder trial even while the outcome was a done deal. The ranking of the shows are interchangeable after you get past the first three positions on this Top 10 New TV Shows list. And, in fact, I moved every show ranked #4 through #10 to different spots before locking down the list. The Plot: The People v. O.J. Simpson is a limited series that takes you inside the O.J. Simpson trial with a riveting look at the legal teams battling to convict or acquit the football legend of double homicide. Based on the book The Run of His Life: The People v. O.J. Simpson by Jeffrey Toobin, it explores the chaotic behind-the-scenes dealings and maneuvering on both sides of the court, and how a combination of prosecution overconfidence, defense shrewdness, and the LAPD’s history with the city’s African-American community gave a jury what it needed: reasonable doubt. The Plot: Set in Hawkins, Indiana in the 1980s, Stranger Things chronicles the search for a young boy who vanishes into thin air under highly suspicious circumstances. His mother opens an investigation into the boy’s disappearance with local authorities that unravels a series of mysteries involving top-secret government experiments, terrifying supernatural forces and one very strange little girl. A love letter to the ubiquitous cult classics of the ’80s, Stranger Things is a coming of age story for three boys that draws this quaint community into a world where mysteries lurk beneath the surface. The Plot: Sometimes life will surprise you. This refreshingly honest and provocative series follows a unique ensemble. As their paths cross and their life stories intertwine in curious ways, we find that several of them share the same birthday, and so much more than anyone would expect. The Plot: Pakistani-American college student Nasir “Naz” Khan, who lives with his parents in Queens, NY, takes his father’s taxi to go a party in Manhattan. But what starts as a perfect night for Naz becomes a nightmare when he’s arrested for murder. The show delves into the intricacies of a complex New York City murder case with cultural and political overtones. The story examines the police investigation, the legal proceedings, the criminal justice system and Rikers Island, where the accused await trial. The Plot: The dramatic series Westworld is a dark odyssey about the dawn of artificial consciousness and the evolution of sin. Set at the intersection of the near future and the reimagined past, it explores a world in which every human appetite, no matter how noble or depraved, can be indulged. The Plot: Billions is a fictional drama that takes an insider look at the world of high finance by tracking the approaching collision between two titanic figures – the hard charging, politically savvy U.S. Attorney Chuck Rhoades, and the brilliant, ambitious hedge fund king, Bobby “Axe” Axelrod. The Plot: Prairie Johnson, a missing blind girl, returns to the community she grew up in with her sight restored. Some hail her a miracle, others a dangerous mystery, but Prairie won’t talk about her seven missing years with anyone except four teenage boys whom she tells her story to in order to recruit them for a mission. The Plot: Atlanta revolves around two cousins on their way up through the Atlanta rap scene whose opposing views on art versus commerce, success and race will make their quest anything but easy. The Plot: The Exorcist is a propulsive psychological thriller following two very different priests tackling one family’s case of horrifying demonic possession. Father Tomas Ortega is the new face of the Catholic Church: progressive, ambitious and compassionate. He runs a small, but loyal, parish in the suburbs of Chicago. He has no idea that his quiet life is about to change forever. Deep in the slums of Mexico City, another priest has found himself locked in a life-and-death struggle with evil. Father Marcus Keane is a modern-day Templar Knight, an orphan raised since childhood by the Vatican to wage war against its enemies. Father Marcus is everything Father Tomas is not: relentless, abrasive and utterly consumed by his mission – and he constantly butts heads with his adversary within the church, Father Bennett. Caught in the middle of the two priests is the Rance family, who are members of Tomas’ parish. On the surface, they’re a normal, American family, but all is not as it seems in this household. The patriarch, Henry Rance, is recovering from a traumatic injury. Eldest daughter Katherine has become a recluse who refuses to leave her room. Her younger sister, Casey, thinks she’s hearing strange noises coming from inside the walls. And mother Angela believes there is something in the house, a demonic presence, growing stronger by the day. Desperate, she begs Father Tomas for help, unwittingly setting the naïve young priest on a collision course with Father Marcus. Separately, each faces an insurmountable task, but together they become the Rances’ only hope against an evil force that has been mobilizing for centuries. The Plot: Tom Kirkman is a lower-level cabinet member who is suddenly appointed President of the United States after a catastrophic attack on the US Capitol during the State of the Union. In this dramatic thriller, Kirkman will struggle to keep the country and his own family from falling apart, while navigating the highly-volatile political arena and while leading the search to find who is responsible for the attack.